This is Version 2 of the Hardwood Suite that was center around the DX Theme made by RedneckDude. Version 2 is an update that includes a WindowBlinds for Hardwood done by RedneckDude. I am not sure If RND will be making more WB skins, but if this is any indication of what he has learned we are in for a treat. All previous and new skins are shown below. As in other Suites if more skins are done they will be added with a link below. I really hope you enjoy this Suite and as always, have a great day. As you can see by the total number of skins for this suite that it was impossible to show everything in three desktops, and there is also a file size limit. You will see some of the old and new skins on the desktops in the screenshot. 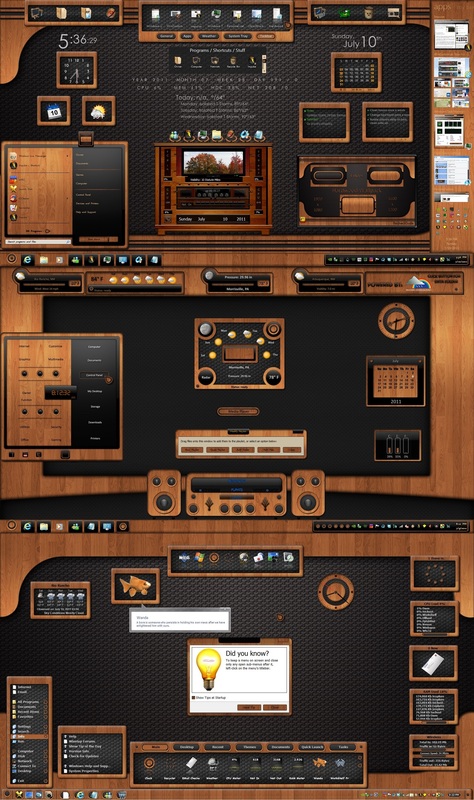 This is one very nice Suite for your desktop with many choices to create your very own unique look. Nimbin just may have found a replacement for RightClick that works on Win 7 64 bit, check it out. Crazy ! 10x Great job ! ALL !!! Man, you've been at it Philly!!! Got the Right Click Extender but the link takes you to a few places before you get to download it. I almost dl'd a game pack. Got to say its the most extensive one I've seen since Heavy Equipment. Wow! Yup this is a big theme Uvah. Nice work again, Philly. Thanks. If you'll check again you'll see there have been plenty of suites. Congrats on the feature, John. lunamiaa and zazaza123 are you using Theme Manager? If you are you should be able to download the suite, open Theme Manager click on settings and click on the setting to use advanced options. Then go back to Themes and select the suite you want to apply. You should get a window where you can select which skins that are in the file to download and apply. I guess I don't understand applying Suites with Theme Manager. When I download a suite is everything included? That is what I thought a Suite was/is. Do I need to go to all the links listed and download all the stuff individually and put it all in the right locations and then the Suite is applied via theme manager and it brings it all together?